I came across this review article on writing tools published in 2019, and wanted to make some quick notes to come back to in this post. I’m following the usual format I use for article notes which summarizes the gist of a paper with short descriptions under respective headers. I had a few thoughts on what I thought the paper missed, which I will also describe in this post. Carola Strobl, Emilie Ailhaud, Kalliopi Benetos, Ann Devitt, Otto Kruse, Antje Proske, Christian Rapp (2019). Digital support for academic writing: A review of technologies and pedagogies. Computers & Education 131 (33–48). To present a review of the technologies designed to support writing instruction in secondary and higher education. Writing tools collected from two sources: 1) Systematic search in literature databases and search engines, 2) Responses from the online survey sent to research communities on writing instruction. 44 tools selected for fine-grained analysis. Tools intended solely for primary and secondary education, since the main focus of the paper was on higher education. Tools with the sole focus on features like grammar, spelling, style, or plagiarism detection were excluded. Technologies without an instructional focus, like pure online text editors and tools, platforms or content management systems excluded. Writing Mentor, Essay Critic, and Grammarly were not considered. This is one of the main limitations I found in the study. It is not clear how the tools were selected in the systematic search as there is no information about the databases and keywords used for the search. The way tools focusing on higher education were picked is not explained as well. In this post, I’m presenting a summary of my review on tools for automatically analyzing rhetorical structures from academic writing. They look at scientific text – Full research articles, abstracts or introductions. Tools to automate argumentative zoning of other open text (Example) are not considered. They automate the identification of rhetorical structures (zones, moves) in research articles (RA) with sentence being the unit of analysis. They are broadly based on the Argumentative Zoning scheme by Simone Teufel or the CARS model by John Swales (Either the original schema or modified version of it). SAPIENTA – Summary notes here. AWA Any research writing NLP rule based - Xerox Incremental Parser (XIP) to annotate rhetorical functions in discourse. Mover Abstracts Supervised learning - Naïve Bayes classifier with data represented as bag of clusters with location information. RWT Introductions Supervised learning using Support Vector Machine (SVM) with n-dimensional vector representation and n-gram features. SAPIENTA Full article Supervised learning using SVM with sentence aspect features and Sequence Labelling using Conditional Random Fields (CRF) for sentence dependencies. SciPo tool helps students write summaries and introductions for scientific texts in Portuguese. Another tool CARE is a word concordancer used to search for words and moves from research abstracts- Summary notes here. A ML approach considering three different schemes for annotating scientific abstracts (No tool). Reference: Simsek, D., Buckingham Shum, S., Sandor, A., De Liddo, A., & Ferguson, R. (2013). XIP Dashboard: visual analytics from automated rhetorical parsing of scientific metadiscourse. In: 1st International Workshop on Discourse-Centric Learning Analytics, 8 Apr 2013, Leuven, Belgium. Learners should have the ability to critically evaluate research articles and be able to identify the claims and ideas in scientific literature. Automating analysis of research articles to identify evolution of ideas and findings. Describing the Xerox Incremental Parser (XIP) which identifies rhetorically significant structures from research text. Designing a visual analytics dashboard to provide overviews of the student corpus. Argumentative Zoning (AZ) to annotate moves in research articles by Simone Teufel. XIP outputs a raw output file containing semantic tags and concepts extracted from text. Data: Papers from LAK & EDM conferences and journal – 66 LAK and 239 EDM papers extracting 7847 sentences and 40163 concepts. Dashboard design – Refer original paper to see the process involved in prototyping the visualizations. XIP is now embedded in the Academic Writing Analytics (AWA) tool by UTS. AWA provides analytical and reflective reports on students’ writing. Reference: Xiong, W., Litman, D. J., & Schunn, C. D. (2012). Natural language processing techniques for researching and improving peer feedback. Journal of Writing Research, 4(2), 155-176. Feedback on writing is seen to improve students’ writing, but the process is resource intensive. Direct feedback using technology assisted approaches (from grammar checks to complex computational linguistics). Peer Review [Considered in this paper]. Good feedback from a group of peers is found to be as useful as the instructor’s feedback and even weaker writers are seen to provide useful feedback to stronger writers (See references in original paper). When providing feedback on other students’ work, students become mindful of the mistakes and improve their own writing. Some web-based peer review systems: PeerMark in turnitin.com, SWoRD (used in this study) and Calibrated Peer Review. Localized information (Providing exact location details like paragraph, page numbers or quotations). Concrete solution (Suggesting possible solution rather than just pointing the problem). Research problem: Studying peer review is hard with a large amount of feedback data. Practical problem: Identifying useful feedback for students and possible interventions to help them provide good feedback. To automatically process peer feedback and identify the presence or absence of the two key features (Providing feedback on feedback for students and automatically coding feedback for researchers). Refer prototype shown in figure 1 of the original paper that suggests students to provide localized and explicit solutions. Building a domain lexicon from common unigrams and bigrams in student papers. Counting basic features like domain words, modals, negations, overlap between comment and paper etc. from each feedback. Creating a logic model to identify the type of feedback (Contains localization information or not/ contains explicit solution or not) – classification task in machine learning. regularExpressionTag: Regular expressions to match phrases that use location in a comment (E.g. “on page 5”). #domainWord: Counting the number of domain-related words in a comment (based on the domain lexicon gathered from frequent terms in student papers). sub-domain-obj, deDeterminer: Extracting syntactic attributes (sub-domain-obj) and count of words like “this, that, these, those” which are demonstrative determiners. windowSize, #overlaps: Extracting the length of matching words from the document to identify quotes (windowSize) and words overlapped. Weka models to automatically code localization information. The decision tree model had better accuracy (77%, recall 82%, precision 73%) in predicting if a feedback was localized or not. To refer the rules that made up the decision tree, take a look at Figure 2 of the original paper. Feedback comment represented as vectors using the three types of attributes(Refer table 2 in the original paper for details). Simple features like word count and the order of comment in overall feedback. Essay attributes to capture the relationship between the comment and the essay and domain topics. Keyword attributes semi-automatically learned based on semantic and syntactic functions. Logistic Regression model to detect the presence/ absence of explicit solutions (accuracy 83%, recall 91%, precision 83%). Domain-topic words followed by suggestions were highly associated with prediction. Detailed coefficients of attributes predicting presence of solution can be referred in Table 3 of the original paper. Study 3: Can Research Rely on Automatic Coding? Comparing automatically coded data to hand coded data to see if the accuracy is sufficiently high for practical implementation. Helpfulness ratings by peers and 2 experts (content, writing experts) on peer comments at a review level. 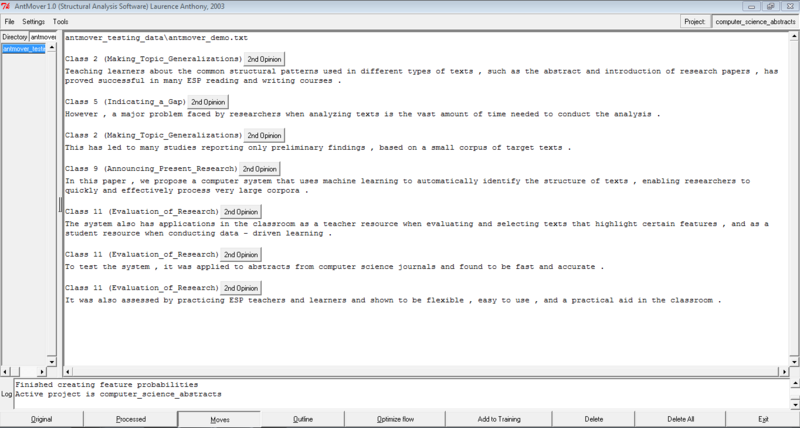 Regression analysis using feedback type proportions (praise only comments, summary only comments, problem/solution containing comments), proportion localized critical comments, and proportion solution providing comments as predictors. 10 fold cross validation – SVM best fit. To check if same models are built using machine coded and hand coded data – 10 stepwise regressions. Refer Table 4 in the original paper to see the feedback features commonly included in the model by the different raters – Different features were helpful for different raters. Overall regression model is similar to hand coded localization data (Most of the positivity, solution and localization were similar between hand coding and automatic coding). Predictive models for detecting localization and solution information are statistical tools and do not provide deep content insights. To be integrated into SWoRD to provide real time feedback on comments. Technical note: Comments were already pre-processed – segmented into idea units by hand; data split by hand into comment type (summary, praise, criticism).